Help us meet our fundraising goal of $450,000 by January 31st. Free software is a crucial tool for building a free society. Donate now to build us up! The NSA and the world's big Internet and telecommunications companies have built a massive Surveillance Industrial Complex that undermines all our freedoms. We need to build our own infrastructure, one that values freedom, privacy, and security for all people. We need your help to do it. The Free Software Foundation has been defending computer users' freedoms and privacy for nearly 30 years. No matter the political climate, we have always fought to defend the freedoms of all computer users. Today, in the face of mass surveillance, more people than ever are discovering that free software is a necessary cornerstone of a free society. With this momentum, we can turn our blueprints for a free software future into brick and mortar. Since day one of the PRISM scandal, the FSF has been sounding the alarm. We've published high-profile op-eds in Wired and Slate, and as members of the Stop Watching Us coalition we marched on Washington to protest mass surveillance. And we're not just talking about the need for change; we're doing something about it. This September, we hosted a hackathon in honor of the GNU system's 30th anniversary, where participants made contributions to a dozen projects that form key building blocks of a surveillance-free future. All the while, we've continued to build towards many more of the prerequisites for a free society. We worked with hardware manufacturers to protect your ability to use free software, giving the "Respects Your Freedom" certification to two new pieces of hardware, a 3D printer from Lulzbot and a USB wifi adapter from ThinkPenguin. We are working to protect freedom of expression online, collecting tens of thousands of signatures against a dangerous proposal at the World Wide Web Consortium that would make it possible to insert DRM into just about everything with HTML5. We've even begun to explore the intersection of housing access and software freedom, appealing to the City of Boston to do away with an arcane system requiring all landlords to register their properties using Microsoft Windows. Our annual LibrePlanet conference will be our biggest yet, bringing experts on cryptography, federation, tech policy, and movement building together around the theme of "Free Software, Free Society"
We will work closely with standards bodies to fight for user freedom in the face of intense corporate pressure to trade freedom for profit and control. We will fight to make free software available on our phones and tablets, our 3D printers and single board computers. These devices have the potential to be an incredibly democratizing force, but they need free software to reach their full potential. We will grow the FSF Licensing & Compliance Lab, a preeminent source for free software licensing support and educational materials. If you are a member of Netflix, Hulu Plus, or Amazon Prime, you may pay a similar monthly amount for DRM-laden streaming video or ebooks. That money helps to fuel industry-led lobbying efforts like SOPA/PIPA or DRM in HTML. Your subscription may amount pocket change for these megaliths, but when you give $10 a month to the Free Software Foundation, you are giving a building block for change. Your dollars are applied directly to our programs to support, defend, and increase the adoption of free software the world over. The Free Software Foundation is only as powerful as our membership base; individual donations account for the majority of our funding each year. This has always been a grassroots, community-supported movement, and it always will be. 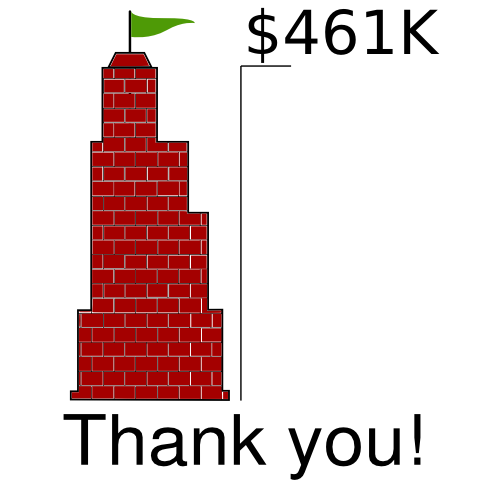 This year, we need to meet our goal of $450,000 to build our vision for the free software movement. You can become a member of the FSF for just $10/month ($5/month for students); when you join, you'll get a variety of benefits, including free admission to our annual conference, LibrePlanet. Become a member or renew your existing membership before January 31st. Please support us at whatever amount feels right to you. Every dollar you give helps to build us up. If you believe in our work, please share this appeal with your networks. "Defective by Design visits an Apple store (with photos)"
"GNU Press announces gray GPLv3 hoodies; plus members enjoy up to 30% holiday discount at the shop! "Speakers and venue announced for FSF's LibrePlanet 2014 -- register today!" The Free Software Foundation has a 4-Star Charity Navigator rating.